If you have an office in your home, you’ve probably run into the problem if having a rolling chair sink into the carpet, becoming stuck and no longer rolling. This can be annoying at the least and make it harder to work at the worst. Office chairs are designed to roll for a reason, so that you can move around as you work, making the best use of your work surface. The second solution is to make your own. There are several ways of making a chair mat out of plywood, which will not only work better than the plastic ones, but look much better too. But the surprising thing is that none of these designs are going to cost as much as the plastic ones, even if you use quality hardwood plywood. Since the plywood will be supported all the way across its width and won’t have to span any gaps between floor joists, you don’t need to use a very thick piece of plywood. You could actually get away with 1/4″ thick plywood, but I would recommend making it out of 3/8″ thick to ensure longer life. The basic size of a chair mat is four foot square. However, there are some that are larger, intended for used when a table is being used as a desk. There are also some which have an extension under the well in the desk, allowing the chair to be pulled up close. This can be done with any homemade chair mat, made out of plywood. One other options, which is not as common, but looks very good is to make a chair mat that is round. We’ll look at that as well. The simplest way to make a wood chair mat is to buy a four foot square piece of plywood and 16 wood-grained linoleum tiles. Other styles of tiles can be used as well, but you’ll lose that nice wood look. It is a good idea to round the corners of the plywood to help avoid them snagging on the carpet. This is easily done with a jigsaw and a sander. You can use a can as a template, lining it up with the two sides and marking the cut line on the plywood with a pencil. Do this from the back side, so that there are no visible splinters. Another good idea for protecting your carpeting is to round over the bottom edges of the plywood with a router and a 1/4″ roundover bit. Be sure to put the right bearing on the bit so that there is no step, but rather a smooth roundover. Sand the cut to remove any splinters sticking up. The bottom of the plywood should be sanded and sealed with either a paint primer or with varnish. This will help prevent any splinters from forming and getting stuck in the carpet. Everything up to this point has been done on the back or bottom side of the plywood. Flip it over, so that the face side is showing. Clean off the surface, and stick the 16 linoleum tiles to the top, aligning them so that there are no gaps. This will be the surface that the chair rolls on. If you want a true wood chair mat, you might want to look at using wood flooring. For this, you’ll want to use pre-finished tongue and groove hardwood flooring. Normally, hardwood flooring is nailed to the subfloor with a special pneumatic nailer. However, the plywood you are using isn’t thick enough for that. So instead, you’re going to glue it. Prepare the plywood base the same as mentioned above for use with linoleum tile. You’ll also need to prepare the edge pieces of the hardwood floor, by cutting off the tongue and groove from the outer edges of the outer pieces of wood. Spread wood glue on the first few inches of the plywood’s surface and lay the first piece in place, aligning the edge with the edge of the plywood. Press it down into the glue well to help it stick. Add more glue to the side of that first piece and lay another piece of hardwood flooring, mating the tongue and groove. If you have trouble getting the two to fit together, a scrap piece of the flooring can be used as a punch, placing it on the outer edge and hitting it lightly with a hammer. Continue adding pieces until the entire mat is covered. Then place weights on top of the hardwood flooring, to clamp the mat together as the wood dries. 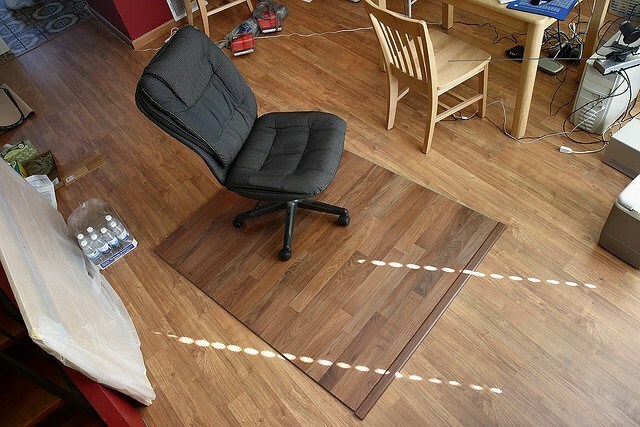 An even simpler chair mat can be made out of hardwood plywood, without losing any of the beauty of hardwood flooring. At the same time, it can also be made round. To make a large circle for cutting, start by drawing lines from one corner of the plywood to the opposite making an X on the backside of the plywood. This will show you where the center is. Drive a small nail or tack into the back of the plywood, in the exact center of where the X crosses. Tie a piece of string to this and tie the other end of the string to a pencil, so that the pencil is just short of the edge of the plywood. You can now use this as a giant compass to make a four foot circle on the plywood. Cut the circle out of the plywood with a jigsaw, working from the back of the plywood to help prevent splintering of the face veneer. Then sand it to remove any irregularities that are created by the cutting. Route and finish the back or bottom side as stated above and apply a couple of coats of flooring varnish to the top side to protect the wood. Be sure to use flooring varnish, as it will provide a harder finish.